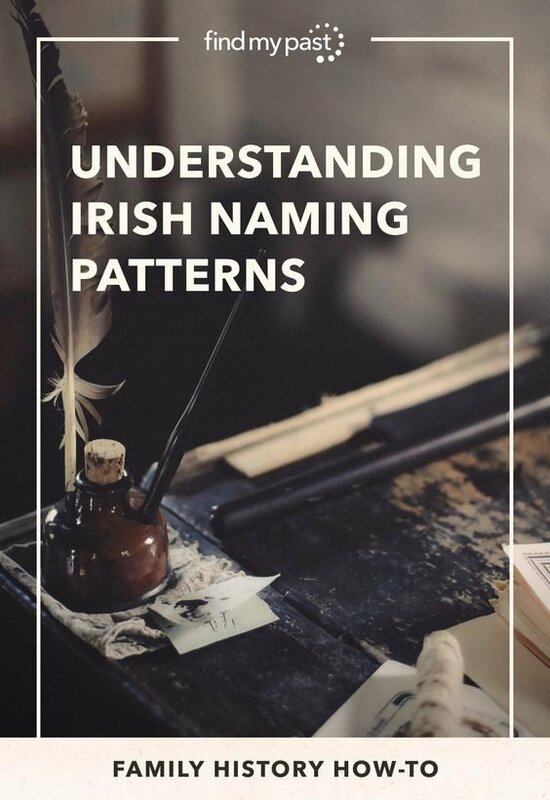 Fiona Fitzsimons discusses traditional Irish naming patterns, knowledge of which can be extremely helpful in piecing together your Irish family history. A similar pattern existed for naming the oldest daughters in a family. It was not as strictly adhered to however, and frequently, amongst the wealthy at least, we see girl's names influenced by fashion. It may be that as girls married into their husband's family and so 'lost' their own family name, the preservation of Christian names was not considered as important for female infants. Unusually, this naming pattern for the sons was adhered to by all economic classes and across all denominations in Ireland. Consequently, it's not unusual to see the same names recurring within the family across generations. This can prove extremely helpful in linking names in your family tree together, particularly if the name in question is in anyway unusual. Naming patterns are sometimes obscured by deaths in infancy. However, where a specific name was considered important within the family, the name would usually be given to the next-born infant. Thus you can sometimes find two or more children of the same name, baptised within the same family. Each baptism of this name, usually indicates the death of the older child of this name, but also tells us that the parents wanted to keep this name alive within the family. Another instance in which this naming pattern can be thrown out is when a child was stillborn or born sickly or dying. The child might then be baptised using a family name, but the name of the paternal grandfather might be 'reserved' for a live birth, or for a child expected to live. This is based entirely on anecdotal evidence, and refers to a number of known cases in all four provinces, which occurred over the last century. Sometimes, however, what may at first glance appear to be a high level of infant mortality, and the re-use of the same Christian name several times within a family, can actually obscure the survival of a much older practice. In the early modern period there was a high incidence of infant mortality. It was common practice within many families to use the same Christian names for children that had died in order to keep the names alive in the family. This practice is best observed by looking at a case study. A number of years ago I was researching for a client and came across the Teare family. With a few exceptions, none of the Teare children were baptised in the same year, and there was a minimum gap of 14 months between baptismal records. There were exceptions, when children of the same name, to fathers of the same name were baptised often within the same year. We widened our search to consider all the baptismal records from this period and found an interesting pattern emerging. The St. Michans registers recorded the baptism of the same male infant twice in 1685: “John son of Samuel Teare, gent, and Mary his wife" was first baptised on 24th Feby. 1685; the registers showed that this child was again baptised on the 12th April 1685. He was buried on 9th August 1685, and a note was retrospectively written against the April record - “he is dead". We see this same practice repeated at this time within the parish registers – a child re-baptised, followed shortly afterwards by a burial record. The evidence points to the only possible conclusion that in each of these cases, the infant was baptised a second time, possibly to try and counteract an illness and 'encourage' the child to 'come on' in health, a common superstition attached to the sacrament of baptism at that time, even within the reformed church. There may be many more instances of this practise, which are obscured by incomplete records. The latest instance of this practice that I've observed is in the 1780s, in a Church of Ireland family. Through cases such as that of the Teare family we can see how important, and useful, a knowledge of these traditional Irish naming patterns can be during your Irish family history research.